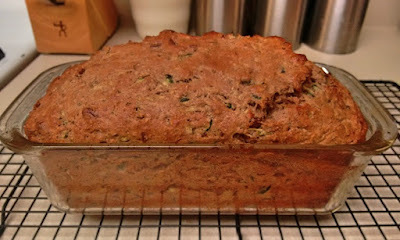 I always struggle with the baking time when I make zucchini bread. 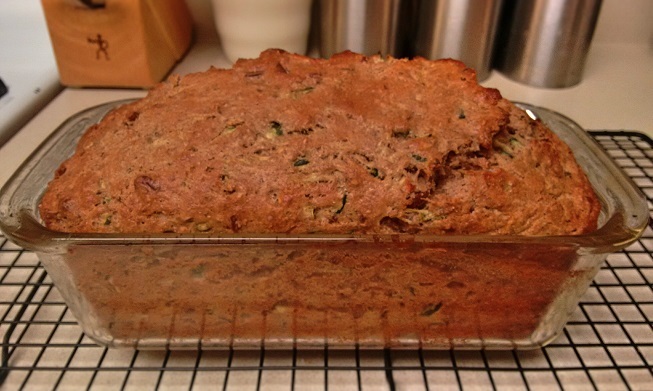 I can bake a banana bread, a carrot loaf or a beer bread in 30-35 minutes at the same temperature in the same loaf pan, yet zucchini bread always takes twice as long. This one took 60 minutes! It was delicious though, so it was worth the wait. Pecans add heart healthy monounsaturated fats, fibre and protein. You can swap the pecans for walnuts in this recipe if you prefer. We buy the giant bags of pecans, walnuts and almonds from Costco, which are much cheaper than buying pecans from the grocery store. I ground the pecans up in the food processor, so some were ground finely like almond flour, but left some in small chunks to add some texture. I measured 1 cup of pecans whole, then ground them, so it was probably a little less than 1 cup after that. Preheat oven to 350°F. Grease a loaf pan with canola oil spray. In a large bowl, combine whole wheat flour, baking soda, baking powder, salt and cinnamon and mix together. Add pecans to bowl and mix again. In a second bowl, add vanilla extract, maple syrup and coconut oil and mash together with a fork. Add eggs and mix together. 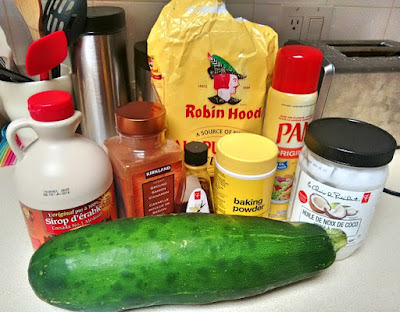 Pour zucchini into the bowl and mix again. Pour wet ingredients into dry and fold together. Transfer batter to loaf pan. Bake for 50-60 minutes. Insert a toothpick into the centre of the loaf, if the toothpick comes out clean, the loaf is done. Set on a cooling rack and run a paring knife around the sides of the loaf to loosen it.